This Joomla! 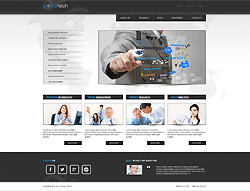 template is tailored for the variety of online business projects. It is delivered with proper arrangement of content, clearly-defined featured blocks, stylish grey background in contrasts to effective page elements. The template can ideally fit your business idea and showcase all your services in clear and memorable way.